Brook's marketing pitch: Go beyond your ordinary. Surfaces tested on: Road, ambient temperature of 25° C/77° F.
Upper: Double layer mesh and support lattice, midfoot strapping system, TPU. 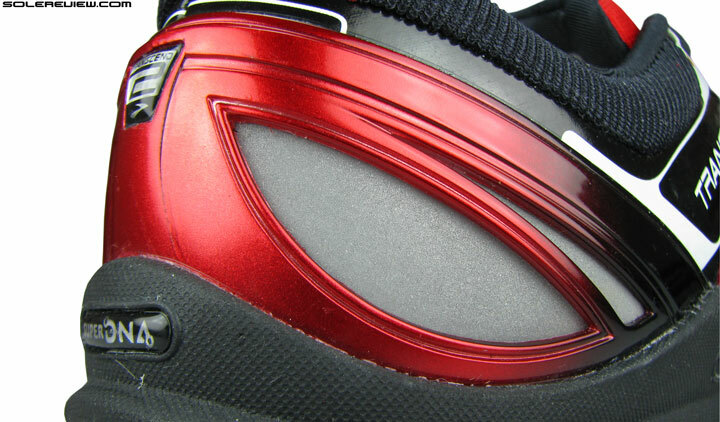 Midsole: Single density EVA blend with firmer 'Guide Rail' cupping. 8 mm heel drop. 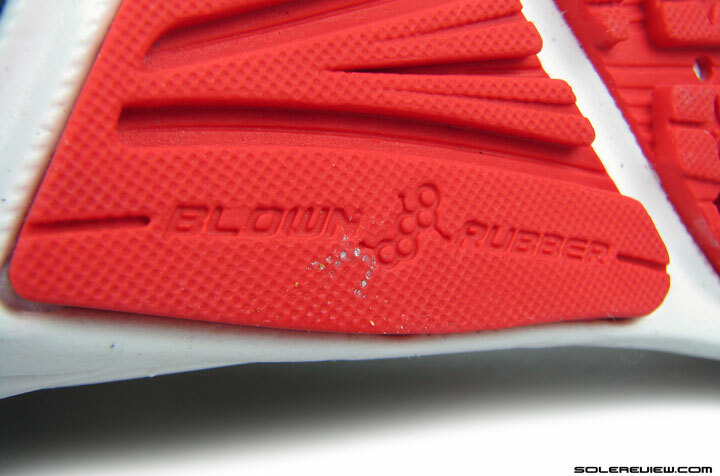 Outsole: Harder rubber under heel, blown rubber under mid and forefoot. Widths available: single - standard (reviewed). The Transcend is redesigned ground up with all new parts, but has little functional impact vs. the previous version. The ride has firmed up, and the forefoot has become more relaxed. Brand new design, but a subtle evolution of function. In our opinion, it would be very productive to offer a shorter version of the review first for the benefit of all interested. So the summary is as follows – the Brooks Transcend 2 rides a little firmer than the Transcend 1, the upper is relatively easygoing, and it weighs 1% more the 2014 design. Is it worth moving up? Not if you already liked the original Transcend. Try and grab the last year’s edition at a bargain price, and save the $$$ for another pair of shoes. You’re very welcome. That’s for the TL;DR crowd, but the rest of you would want to stay and read our detailed review, yes? Last year’s launch party is over. Last year Brooks made quite a marketing splash during the Transcend Launch. Examples of which included double page spreads and video ads in magazines, and sending shoes in Rocketship shaped boxes to a small group of people. 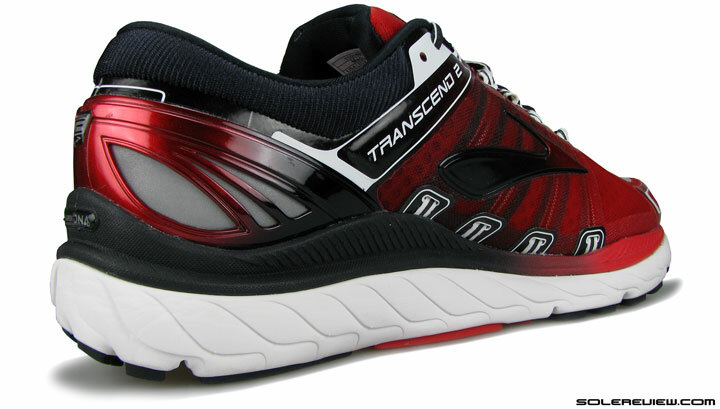 On paper, the Transcend was supposed to replace the Trance 12, but in reality, the two couldn’t be more apart. We covered this at length in our Transcend review, but here’s the gist of it. 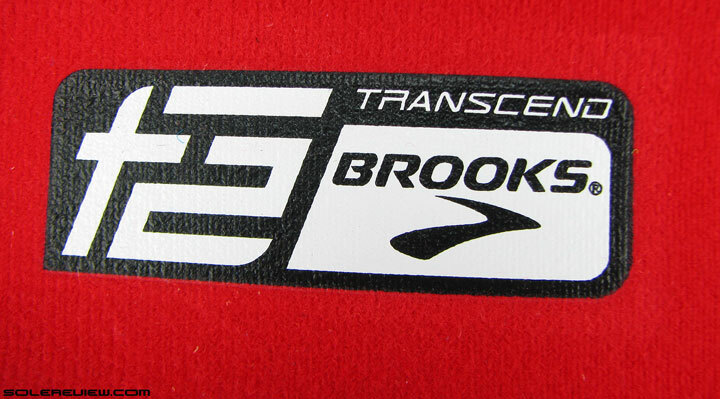 Brooks slots the Transcend 2 under its ‘support’ category, a middle ground between ‘guidance’ and ‘control’, respectively represented by shoes such as the Ravenna 6 and Beast 14. 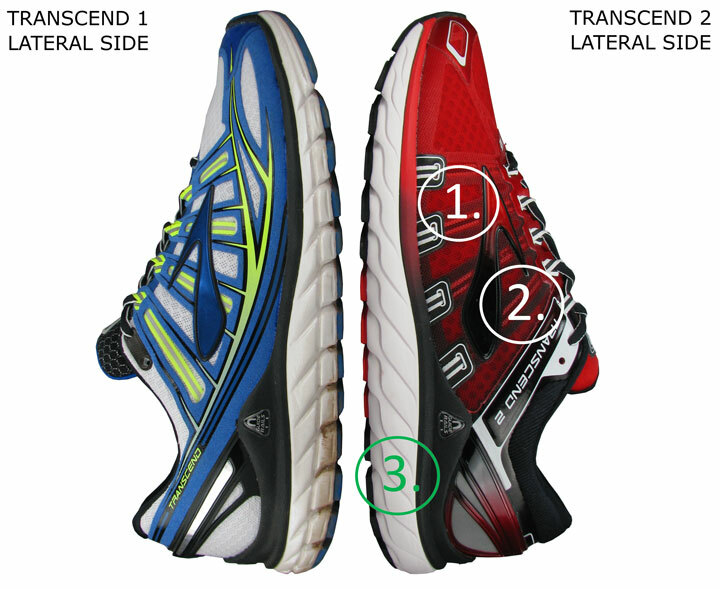 Barring the Transcend, shoes within these three categories feature motion control elements such as a harder medial post. No dual density magic here, just a single layer of midsole foam. 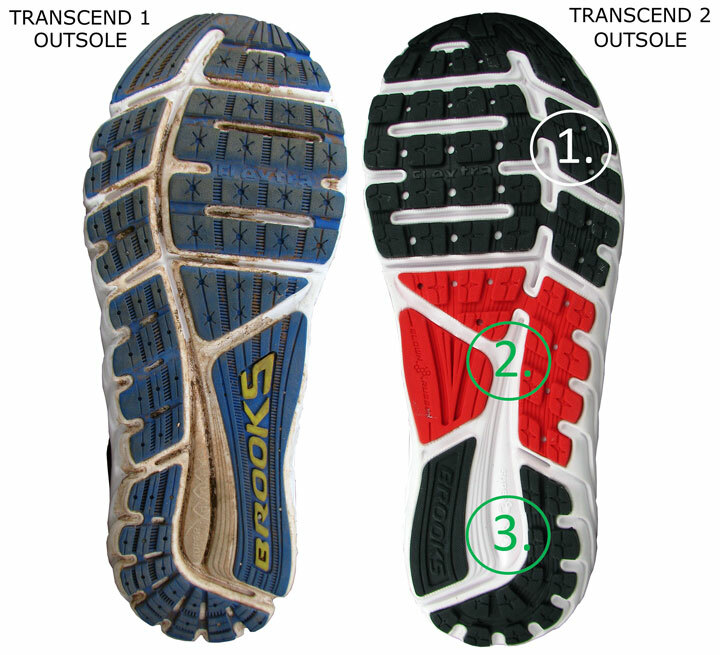 The Transcend 2 does not adopt the use of a dual density midsole. It relies on single density foam between the upper and the outsole, and there’s something called the ‘Guide Rail’; a hard EVA rim mounted on the main midsole. Its walls extend upwards around the midfoot and heel area, the idea being to prevent foot roll by means of a cupping action. This is supplemented by the unusually wide outsole footprint below the midfoot. Guide Rails help reduce bias or lean. We’ve used the Transcend 2 for two weeks now, and our opinion of the shoe hasn’t changed from the time we reviewed the original Transcend. We think of it as a neutral shoe which feels supportive, yet very different from what traditional stability shoes are. The ride is fairly unbiased, keeps the foot centered owing to its midsole firmness, the snug upper and the Guide Rail. Asics and Brooks are probably the only two brands to completely revamp the design of their core models each year, regardless the magnitude of updates. Most brands prefer take the approach of ‘upper-refresh’ year on year, while keeping the midsole update limited to a biennial frequency. Needless to say, there are barely any carryover parts on the new Transcend, save for small areas such as the heel lining. So if everything is new from a material and design perspective, what is the extent of functional updates? We did give you the headlines (firm midsole, changed upper fit) right at the start, but then, what’s a sole-review without tons of pictures and the geeky stuff to go with it? 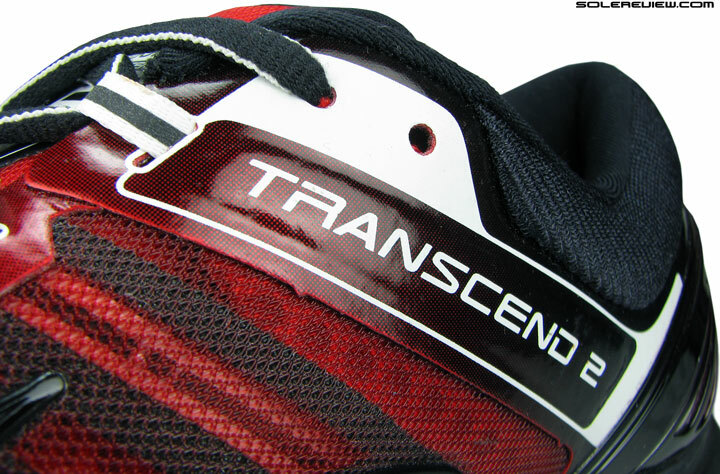 At its very core, the Transcend 2 stays fundamentally unchanged from last year. There’s a supportive upper over a high volume foam midsole and the familiar Guide Rail in between. Within the boundaries of that design, there are updates which result in the slightly changed character of the Transcend 2. Like the firmed up ride, which happens because of two – ok, make that three – things. 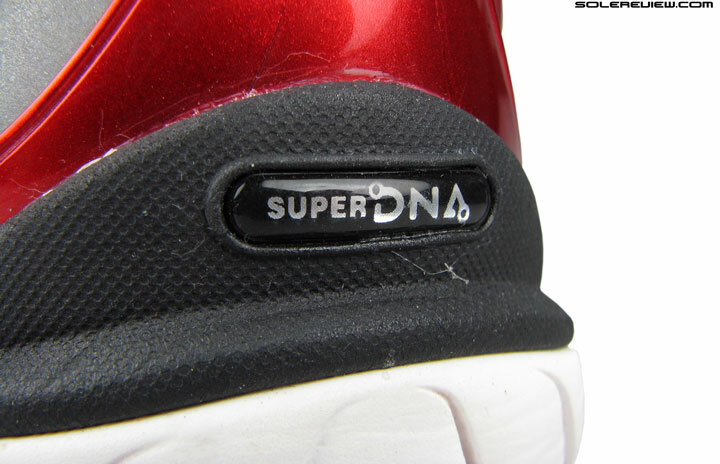 We still have no idea what the SuperDNA is supposed to do, besides being (obviously) a simple cushioning element. The midsole foam used on the Transcend 2 has been made firmer, which makes the shoe, uh, less softer than the Transcend 1. It uses the same material, the unimpressive SuperDNA compound, but this time minus the glossy finish over the midsole walls. Understandable, given that the Transcend is no longer in the marketing limelight. No more rocket-ship shaped promo boxes propel the shoe into marketing stratosphere. 1) Strap position now straight down instead of curving forward 2) Straps no longer reflective 3) Midsole ridging gone, filled out. No horizontal ridging of the v1, only vertical waves. There’s also less sculpting on the midsole walls. Last year, there was a ridge/groove which halved the upper and lower sections of the lateral midsole, with a deeper grooving separating the heel crash pad. 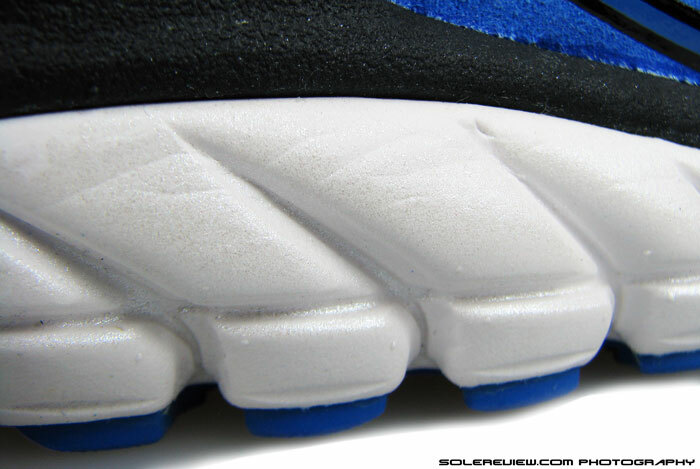 That ridge is now filled over with foam, giving the midsole an appearance of a solid foam block with forward facing vertical ridges. The crash pad is also toned down when it comes to articulation. 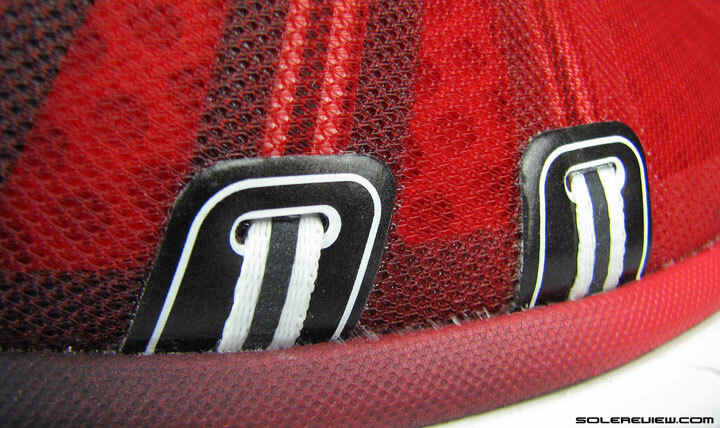 Exposed under-heel midsole area has a deeper recess. 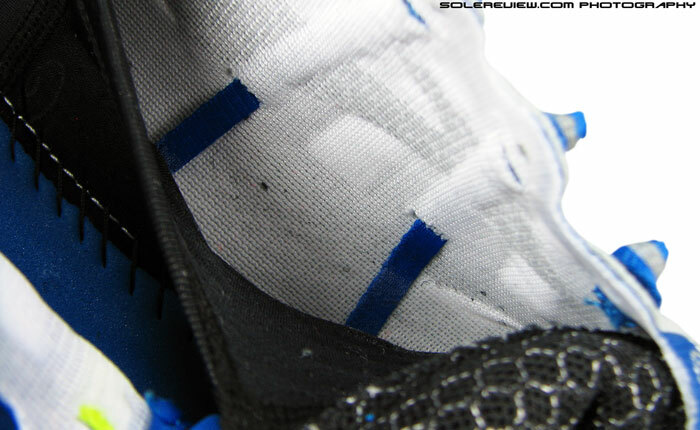 Lastly, on the outsole, the exposed part of the heel midsole sits a little more recessed inside. Which means that while this area of the Transcend 1 made contact with the ground with every rearfoot strike (in the outsole comparison picture, you can see dirt marks on the T-1 outsole), the same portion stays unscathed on T-2. While it still aids in the cushioning sensation with each footstrike, it manages to stay well clear of the ground. 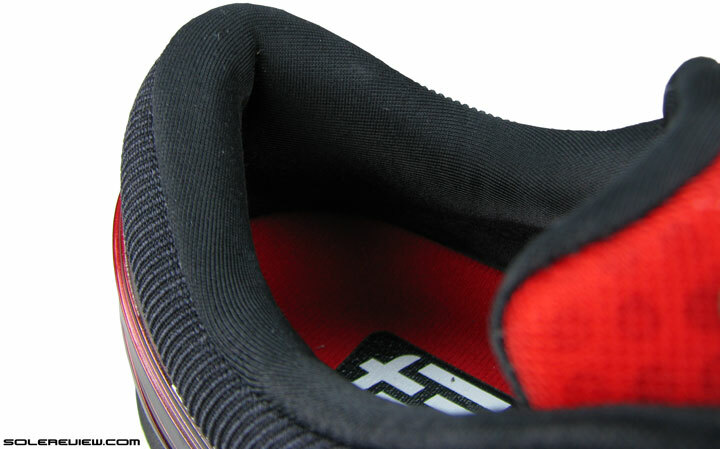 Same insole shape, slightly coarser top fabric than the v1. 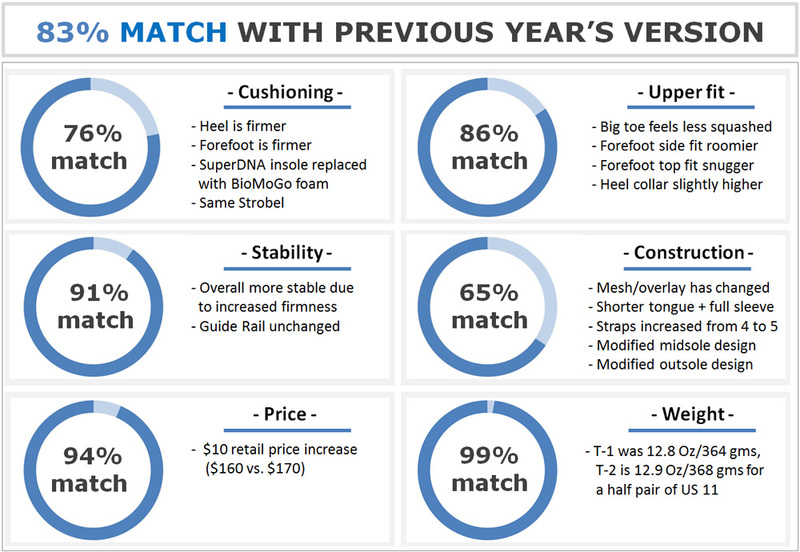 SuperDNA insole no more, BioMogo it is this year. The insole has changed too. Not in shape, but in material. Brooks used SuperDNA foam to construct its insole last year, and that is now changed to include BioMogo, a material which Brooks claims degrades faster in landfills. Does it make an impact on cushioning levels? Don’t think so; the compression levels feel the same, though the SuperDNA texture felt far more smoother and buttery to touch. The EVA color now looks bleached instead of the preferable off-whiteness of the previous T-1 footbed. Increased midsole foam firmness and the removal of grooving (which includes the crash pad articulation) has an impact on the overall cushioning softness. The harder foam also prevents the exposed midsole area (under the heel) from splaying out, which contributes to the deficit of sensory softness. 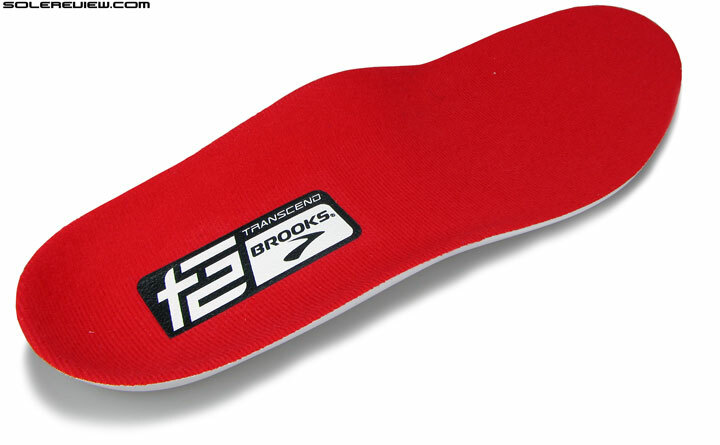 The deeper grooving was also present on the rounded crash pad area of the Transcend 1, so the dilution of it results in a slightly less compressive heel-strike. What hasn’t majorly changed, however, is the high quality of transition. 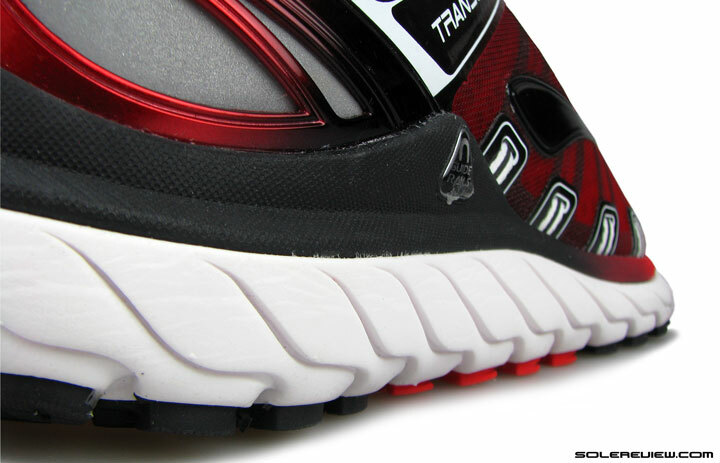 It stays true to the original Transcend’s brief, delivering consistency by means of uniform foam density. There are no pockets of soft or hard foam on the Transcend – forefoot landing or rearfoot strike, the shoe feels the same. This might be too much of a shoe to go fast, but bulks’s no deterrent for running long. It is heavy at 368 gms (minuscule 1% increase over the T-1), but you don’t feel that weight when in motion. 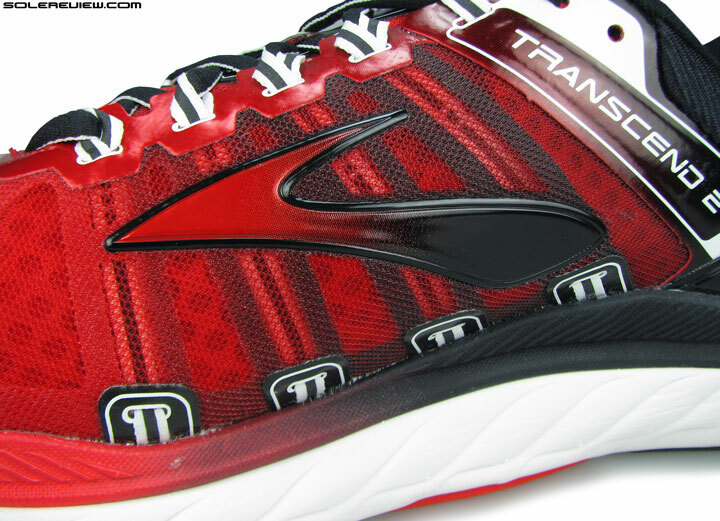 All this while, there was this uncanny feeling that the Transcend 1 felt smoother to run in than its newest self. Now it is difficult to pinpoint what the exact reason might be, but we have a fairly educated guess. We sought some answers by turning the shoe over, and poring over the revised outsole design. 1) Rubber lugs are now more aggressive in design 2) The transition line is interrupted by outsole rubber in mid and forefoot 3) Exposed heel midsole ridge is now deeper. And the Transcend 1 outsole may or may not have stepped on animal poo. 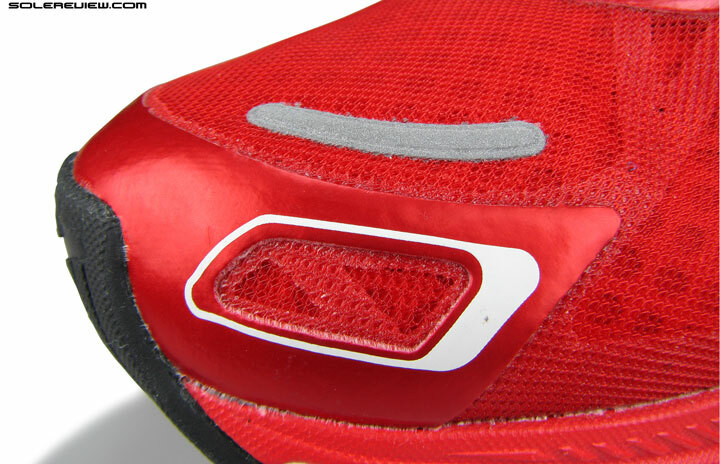 On the face of it, the outsole layout appears similar, a subtle visual evolution of sorts. Look closer, and much like a set of ‘spot the difference’ pictures, details of changes transforms from a blur to focus. 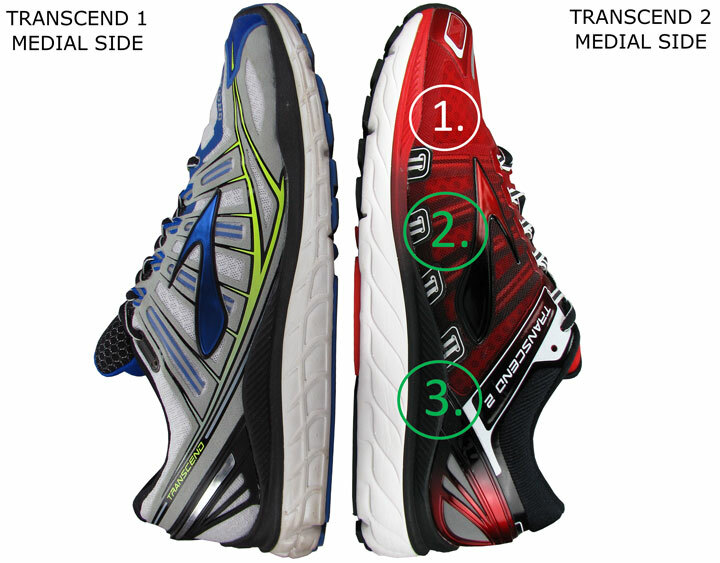 The outsole lug design is more aggressive, raised up, compared to the more flatter profile of the ones on the 2014 Transcend. The lug edges are now sharp, in contrast to the rounded, tapered corners of the Transcend 1’s outsole. The former design, we deduce, helped the Transcend 1 glide over road more softly and smoothly than the Transcend 2, as the weight transferred from lug to lug in a more unbroken fashion. In a way, it felt as if the outsole was an integral part of the midsole instead of being a separate layer. More so than the Transcend 2. Both shoes have a transition groove cutting along the outsole length, and in Transcend 1’s case it ran deep and uninterrupted from heel to toe. 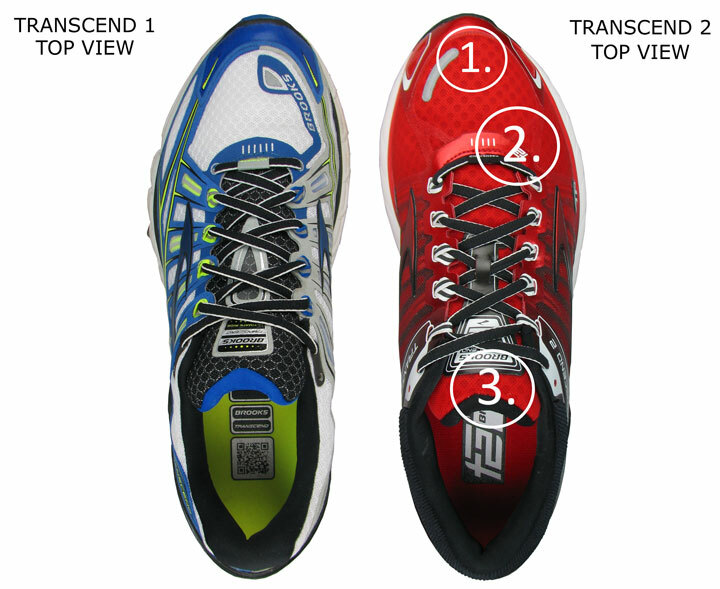 The Transcend 2 closes the groove at three points under the forefoot/midfoot, and it also ends short of the tip. We believe this to be another reason behind Transcend 2’s drop in smoothness. Flexibility is marginally lower on the T-2, but really hard to tell during road use. The midsole flare is reduced medially, but the wide outsole footprint stays unchanged. Stability and overall sense of support was the original Transcend’s strong suit, and from that angle, the T-2 isn’t a deviation. If anything, it lends the feeling of being more supportive owing to increased firmness. The outsole has a wide, mammoth footprint and serves as a base to securely plant your foot during the gait cycle. If you remember, we did a small like to like comparison with a Ghost 6 midsole and showed you how thick the Transcend’s waist was. Astute running shoe geeks will observe that the midsole flare under the arch has been toned down on the Transcend 2. This seems to have been achieved without narrowing the outsole footprint, so no impact on stability. At least not to the extent anyone would notice. The firmer foam compund and Guide Rail produce a supportive ride. Throw in the ‘Guide Rail’ made of ultra firm EVA, and you have a very supportive package, incapable of tossing your foot around. It rises up on both sides from heel to midfoot and glues itself over the unmissable, molded rigidity of a heel counter. But as far as influencing actual foot roll is concerned, the jury is out on that one. 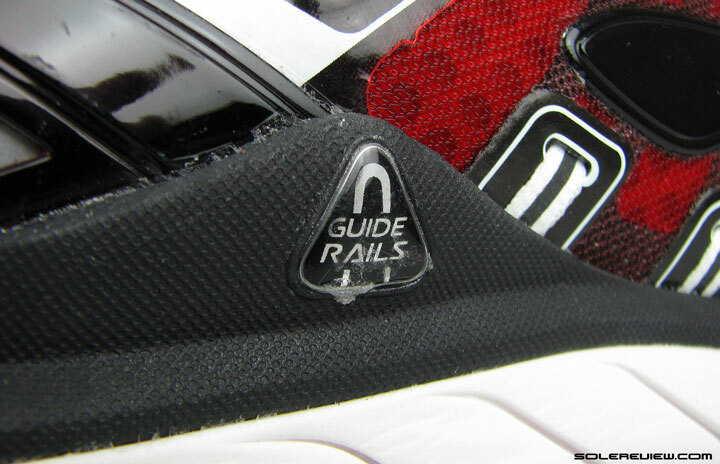 Because on the medial (arch) side, the Guide Rail rises up from the midsole, but barely above the insole level. The ‘Guide Rail’ isn’t in vain, however. It adds value by increasing the overall midsole firmness and by providing a cupping action. This eliminates any swaying and helps the foot track a straight line. If we haven’t said this three times already – the Transcend has neutral ride manners, but the aura of support is what sets the shoe apart from rest of the crowd. The support lattice lies in between the two layers, and is fused to the top mesh. 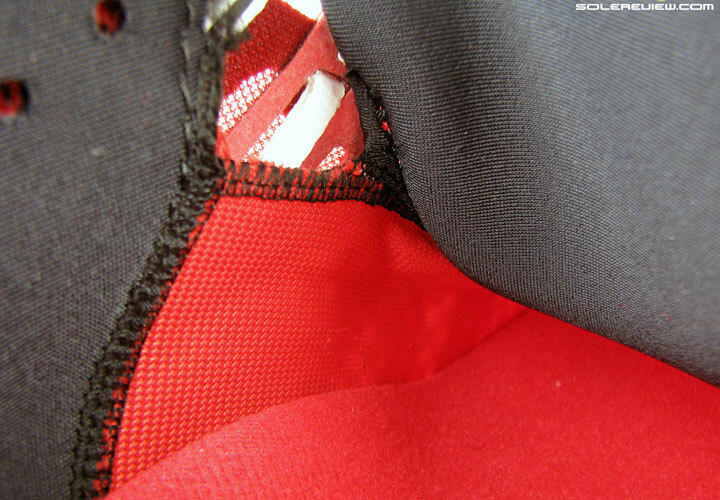 The second layer (flat air mesh) doubles up as the sleeve. The new T-2 upper undergoes plastic surgery, and is reborn this year looking much shiny and synthetic. The soft artificial suede of the Transcend 1 is gone, and so is the single layered, pliable air mesh. The new upper is tri-layered; a thin see through mesh screen on the top and a softer flat mesh closest to the foot. In between both of them lies sandwiched a substrate which gives the upper shape and structural support. 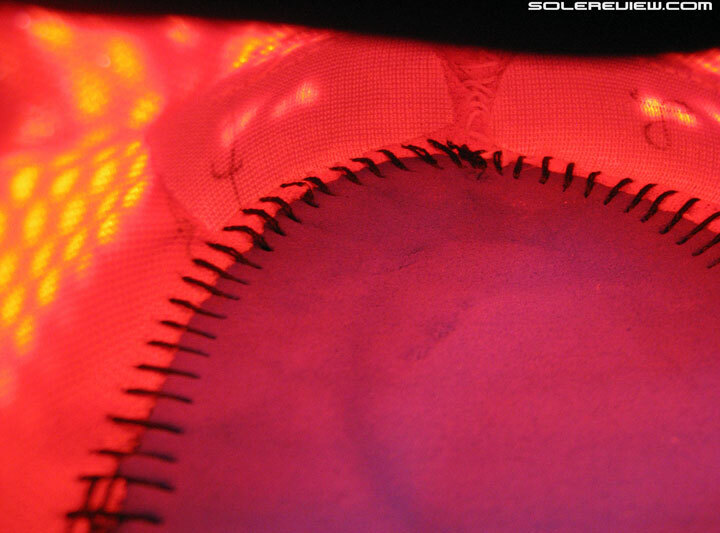 This material is glued to the top mesh layer. Similar midfoot cinching set-up, but the straps increase from four to five. Also, not reflective anymore. Midfoot treatment looks similar to the Transcend, as it relies on a system of straps attached to the lacing. However, the latest Transcend brings about a few changes in how the straps go about their daily business. 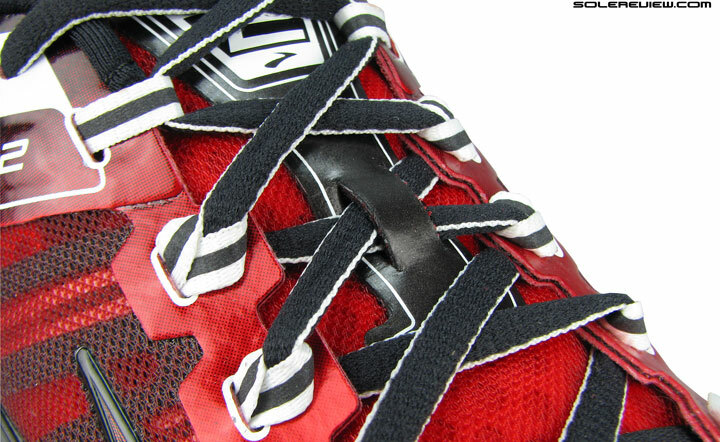 The number of straps connected to the laces increase from last year’s four to five. The T-1’s first row of lacing passed through regular eyelet holes, but this year, the same row hooks up with the internal strap. The T-2 has a full inner sleeve. Inner sleeving extends from midfoot to toe. The midfoot strap extends outward at its base, vs. Transcend v1’s concealed design. Change in sleeve construction means exposed midfoot straps. Also to be noted is that the Transcend 2 now features a full inner sleeve. 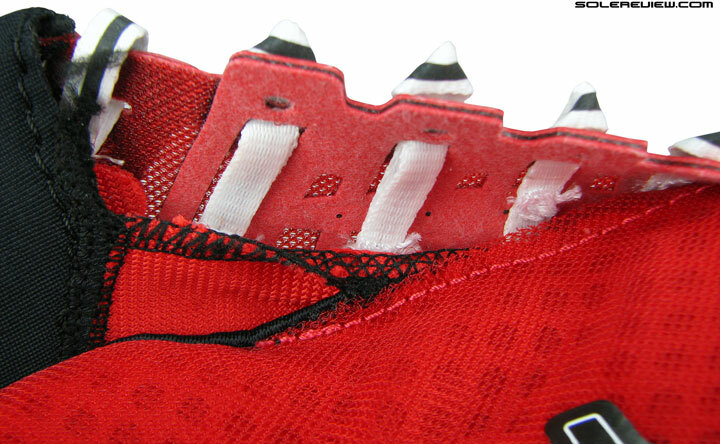 Meaning that the lower most mesh layer extends right from the collar area to the toe tip, not glued to the upper forefoot like how the T-1 was built. This also leads to the midfoot straps being exposed between the upper layers, and their base is now visible on the outsole. Recall how the T-1 was designed; half of the strap length was concealed between the fabrics. The lace loop moves forward, making the forefoot height shallower. 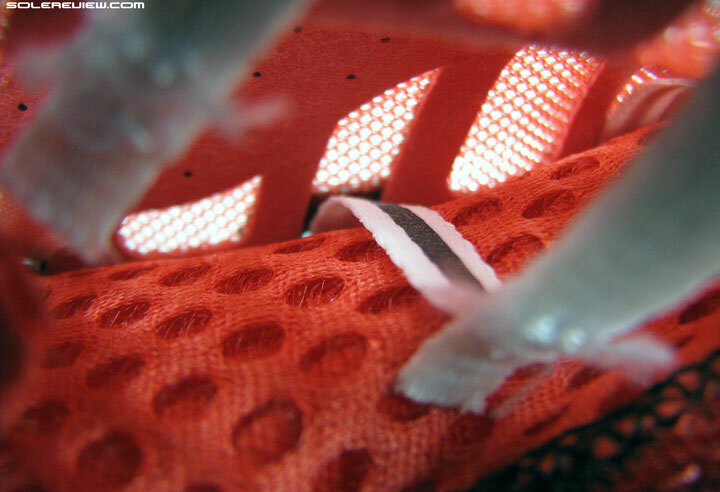 The Transcend lacing starts a bit early on the forefoot, 4 mm to be exact. 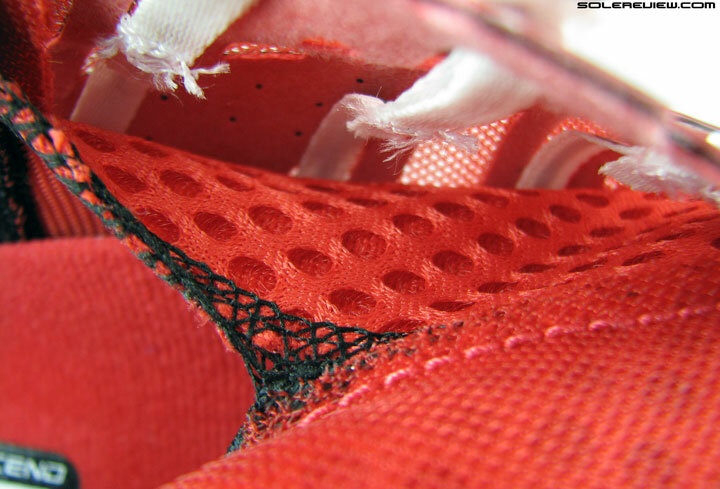 The lace loop is now placed ahead of the first row lacing – instead of being aligned with it in Transcend 1. 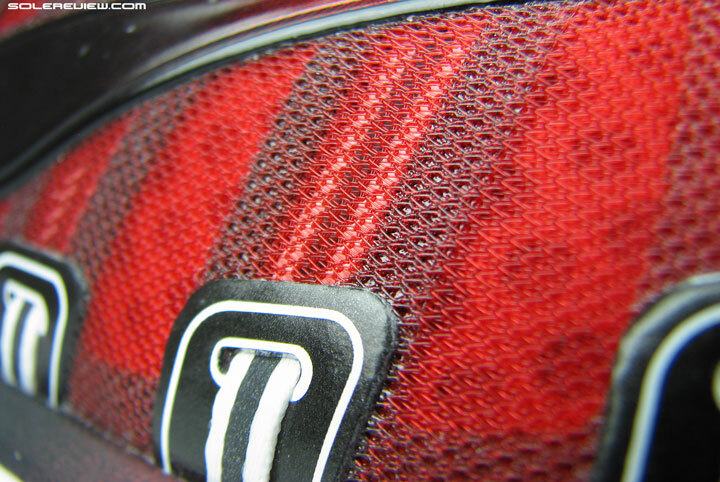 The entire area is also thicker; the synthetic leather material and under mesh lattice makes it so. Things have changed in these parts. Mainly a beefier heel counter. Marginally higher collar walls, and less plastering of layers on its outside. The straps might not be reflective anymore, but is compensated with this giant pair of shine brights! That’s how the Transcend 2 rolls at night! There are a few changes in the rear. 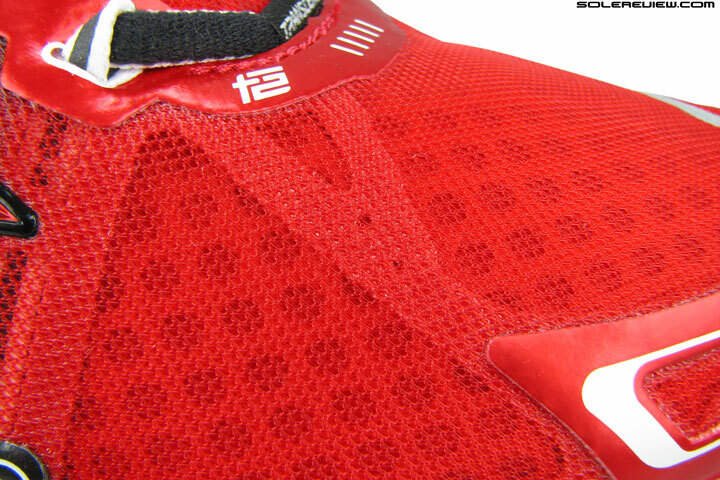 The tongue is noticeably shorter than the Transcend 1, and the collar walls are raised higher. 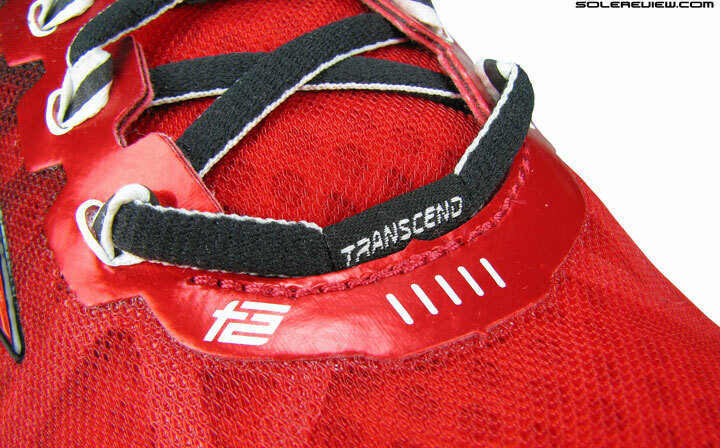 The side straps on Transcend 1 used to be reflective, and that has changed this year. Reflectivity is moved in its near-entirely to the back of the heel, paired with a small strip on the toe box. Toe bumper is moved forward slightly, creating some breathing room for the big toe. As far as the upper fit is concerned, there are subtle changes – and it makes sense after laying out the minutiae of construction changes. At the very tip, the toe feels less squashed as the revised toe bumper is less slope-y over the foot. This does not change the lengthwise sizing – it was true for Transcend 1, and same goes for T-2. Because of the change in lacing position (T-2 moves it forward), the top of the forefoot is snugger/lower than the 2014 Transcend. But that’s made up on the sides, where the new shoe feels more easygoing than the Transcend 1. There are lesser overlays this time, and also consider the fact that the first row of internal straps does not extend forward (picture) like on the Transcend 1. Roomier forefoot and toe bumper when compared to Transcend v1. Snug midfoot fit, helped by the strapping system. So the fit update ends up being a curious mix; being snug on the top, yet relaxed (relative to T-1) on the sides and toe bumper. All that said, the Transcend is still a snug fitting shoe, befitting its ‘support’ tag. The midfoot lockdown is effective, and this is also the shoe to buy in case you like the feeling of under-arch support. The midfoot props up the arch before it comes to rest on the molded insole flare. A lacing guide, a new addition on the Transcend 2. A mite less plusher than past year. 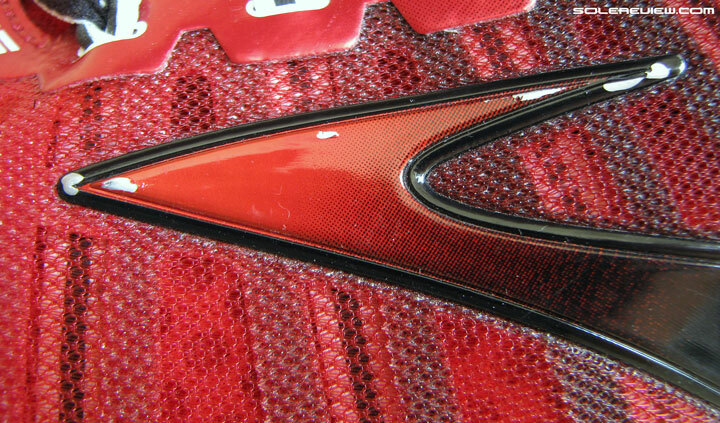 Tongue is definitely a step down in plushness, as the softer materials of yesterday are replaced with the new mesh. 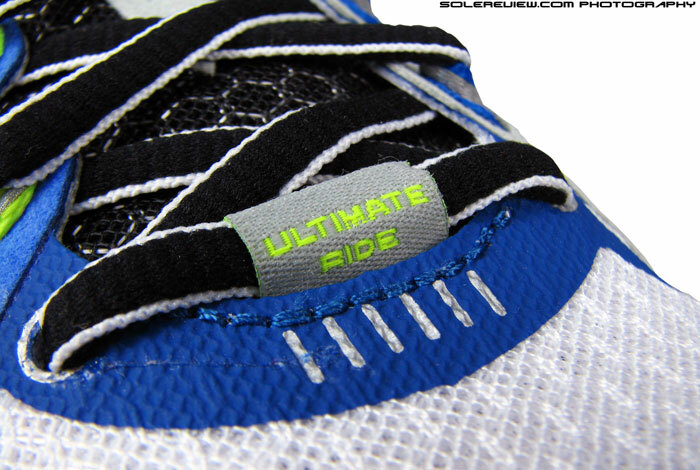 There’s also a bigger synthetic lacing guide (not on T-1) on it too. We did mention that the collar walls are higher, so there’s an increased sensation of wrap. The outer collar is kept free of any layering material over them this year, so that adds to the elevated feeling of plush. Flaking logo paint after 2 weeks of regular use. There are a couple of minor things at which Transcend 2 could do better. First of all, the Brooks logo on the sides has some kind of paint, which starts flaking off after using the shoe for a couple of weeks. Especially around the edges, which are more prone to scuffing. 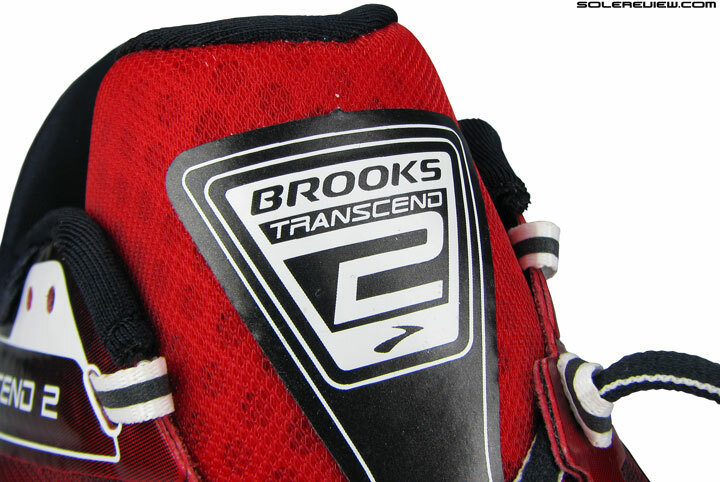 The Transcend 1 did not have this problem, as it seemed to use a different manufacturing technique for the logo. The accompanying picture (above) shows what our pair of T-2 looks like now. This has zero effect on how the shoe performs, but for $170, you’d want your shoe to look as fresh as a cucumber in its early days, logos and all. Under barefoot use, this will stick to your heel in warm summers. The second issue (not really a deal breaker, but we’ll call it out anyway) is that the printed section on the insole tends to stick to bare skin in case you’re not wearing socks. The printed area isn’t really bigger than T-1, but it is one single piece instead of three smaller ones – perhaps that is why we did not encounter this on the Transcend v1. Functionally, the Transcend is free from any flaws worth writing about. If you’ve been a proud owner of the original Transcend, it won’t take long to get under the skin of the second edition. Very small changes, ones which concern the cushioning (firmer now) and forefoot upper fit (wee more relaxed). For the uninitiated, the Transcend 2 is a firm riding neutral shoe in support guise. Stability here is meant in its literal sense, and not the pronation/motion control type. Our whole rant on its classification is here. It’s one of the shoes to check out if you’re a heavier runner, but don’t want/need the motion control elements of something like the Brooks Beast 14. 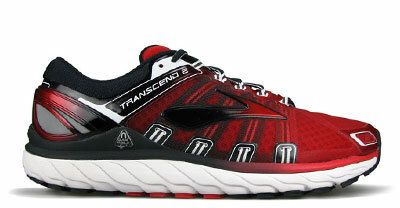 There aren’t many shoes on the market which fill this niche, and for that alone, the Transcend 2 is an unique product. And no, the Transcend 2 doesn’t come in extra widths; it’s a take it or leave it kind of fit. Looking to upgrade your old Transcend 1 to the latest version, but not sure how the 2015 model compares? We can help here. The following infographic is a ready-reckoner for what changes you might expect in the new model vs. old. To make this more fun, we’ve put in a system of percentage match, which calculates a weighted average for a set of attributes. Thanks for ruining the “not a replacement for the Trace” replacement for the Trace, Brooks! Put 550 miles on my Trance 12 until at 250 lbs, 6’4″ finally pounded the cushion out. I suspect Brooks hired a bunch of younger lighter weight hipster designers who don’t need support (video glimpses inside). I now run on Beast 14. I do hope they don’t rework the Beast for hipsters. Pretty cool comment. Makes a lot of sense. Some of us are older and carry more weight around now a days. My Trance 12 with 550 miles has almost no wear on sole, but no cushion for road running. I looked everywhere online for another pair of Trance 12’s, tried on all sorts of alternatives before settling on Beast 14. Trance was legend. I actually logged well over 1,000 miles in each of the pairs of Trances I owned. I only tossed them when I wore a spot through under my forefoot. They were great because they were a plush version of the Adrenaline. I can run in neutral or stability but prefer stability. But I hate stiff shoes. I’ve owned three pairs of Adrenalines and the only halfway cushy pair was the Adrenaline 9. All I want is a plush shoe with stability and a 10 mm-ish drop. After reading the review I feel tempted to order the Transcend 2 again although I came to the conclusion that they feel too bulky and stiff for me… But they actually felt wonderful stable and comfortable (had to size 1 up). Have to say that it´s one of the shoes that I like although I wouldn´t buy them at full price. Have you tried the Transcend 1? What is your opinion if so? Only briefly – the upper felt tighter on the sides and I had a different impression when I put them on. Like the midsole felt slightly different – if you say T2 is firmer I believe you – to me it felt like the T2 had a higher more responsive midsole and the T1 felt unremarkable. But again, I didn´t really run in them – just a little in the store with T1 and around the coffee table at home with the T2. Correct, the T-1 upper feels tighter due to the change in design. There is a reason why you might have felt the T-2 to be more responsive, especially during walking. 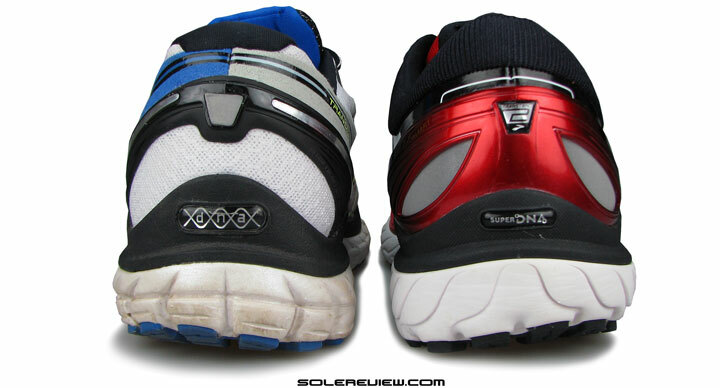 The midsole being firmer, the insole tends to compress more just immediately underfoot, and that feels softer. 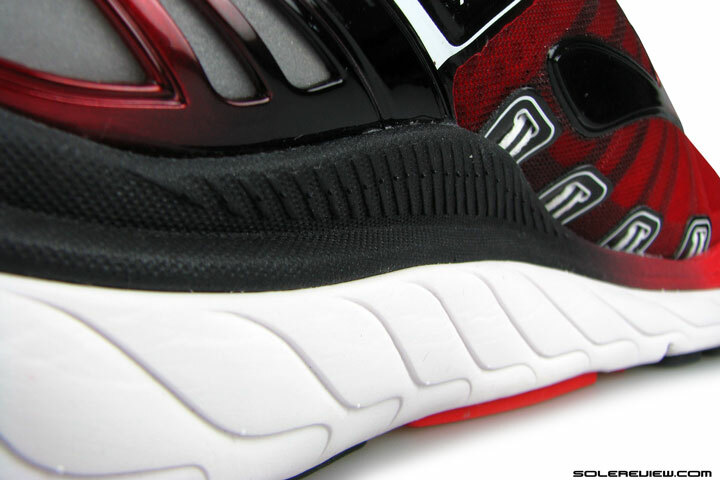 T-1 on the other hand, has a softer midsole which feels more effective only when you run in them. The Nimbus 17 is even more softer than the already soft 15, so you need to take that into account from a stability perspective. As you pointed out, T-2 is far more stable than the Nimbus. Transcend 1 has been holding up well over the past year, so see no cause for worry as far as T-2 is concerned. The outsole is more durable than it looks. Why would Brooks take a shoe that they advertise as their most cushioned ride and make it firmer? They touted how plush and cushioned the ride of the G12 was going to be and it turned out firm. 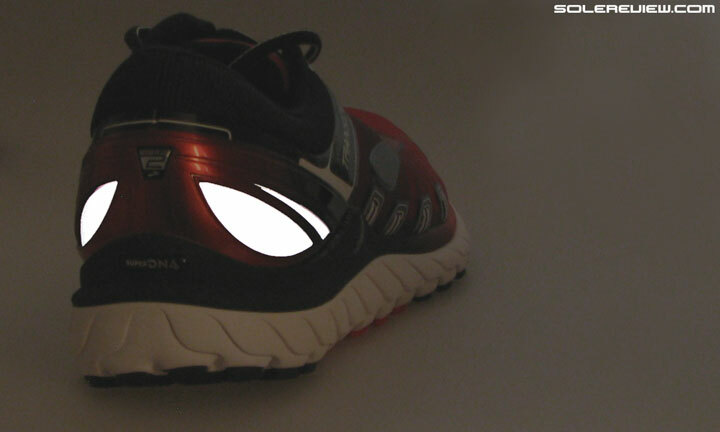 While there is a lot of cushioning under both shoes, it’s firm cushioning. The problem is, when people hear cushioned and plush when talking about the ride of a shoe they are thinking soft. These shoe companies, in my opinion, need to run some in Hoka’s so they understand the definition of soft. Oh well, just wanted to get that off my chest. 🙂 By the way, your reviews are very helpful in purchasing shoes. 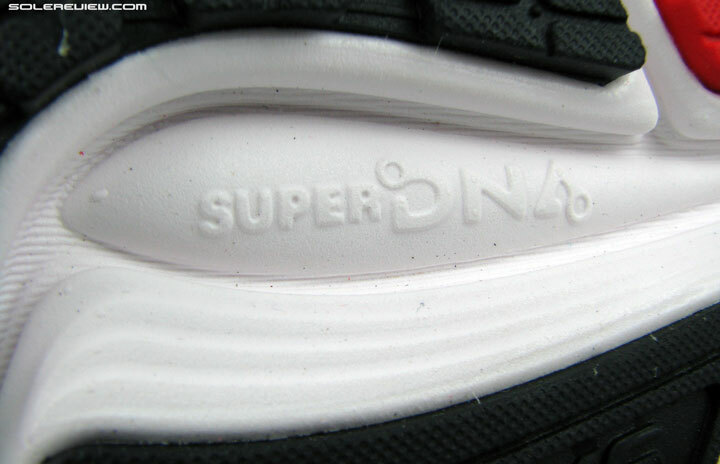 Their troubles started when they moved to the ‘new’ and ‘30% more cushioned’ SuperDNA foam. Don’t forget their Hydroflow tech. I actually liked the old GFS back in the day until the normal cushion wore down and when I opened up the shoe to see what the hydroflow really did… sorely disappointed. It felt very solid actually. Then I tried on a pair of the Brooks T2 which was seriously one of the best shoes I’ve ever tried on at the time except the inside rubbed my pinky toe so I could never wear them. I tried a few different sizes but it was not meant to be. DNA seems like a joke and from what it looks like Brooks is nothing more than a standard running shoe with nothing to offer like Zoom Air or even Adidas Boost which I have not tried out personally. Actually the GFS 100, along with models such as the Chariot and Enterprise, had oil filled Hydroflow pouches. It was highly pressurised, hence the firmness. DNA foam is vaporware, while adidas Boost is great – try the Glide Boost. 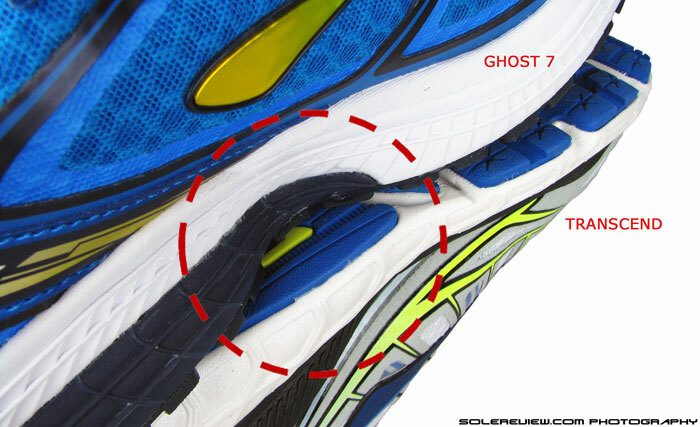 I really don’t understand what Brooks is doing cushioning wise….what was wrong with the gel!? As a retailer that sells brooks, I don’t know if I can continue to recommend them over the competition as they have far advanced cushioning methods to basically glorified eva foam. Agree, Brooks will need to step up its game if needs to compete. The new SuperDNA foam has nothing on tech such as Nike Lunar, adidas Boost. Even Underarmour’s creeping up from behind. You must be kidding. Lunar and Zoom are the most vivid examples of glorified, marketing gimmick. Do take them apart if you are ready, Neo. Disagree, Zoom is very effective, and Lunar isn’t bad either. Flywire is a gimmick, and so is Nike Air Max 2015/16. The comments thread will be closed till January 17, 2016. Premium access members can continue to use their dedicated comment section, which will be open.